The older I get the more I realize how amazing my parents were. How did they manage eight children? My sanity limit is tested with my two kids. Thank you, Mother and Daddy, for teaching us that people are good unless proven differently. Thank you for instilling in me the confidence that can only be had when you know that you have unconditional support and love. Thank you for teaching me about Heavenly Father and Jesus Christ. Thank you for teaching me faith, hope, stick-to-it-ness, optimism and the value of hard work. I love you and am thankful for you on this day and every day. It was my father’s sure-fire solution to the whole sneak-the-cookies situation. My older brother Aaron was a master at sneaking cookies and leaving the empty cookie container. One day my father had just had it. Several days later my father announced the Cotton Cookie Campout. 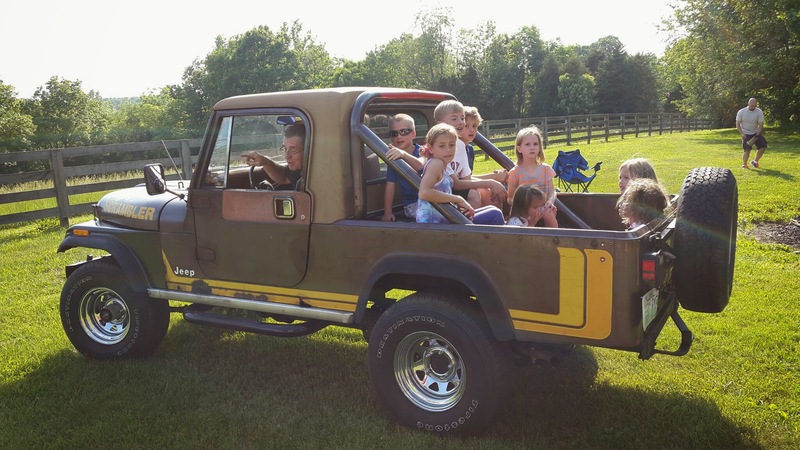 Papa always treats the kids to a ride in his latest fun motorized vehicle: four-wheeler, tractor, truck or this year’s “Tonka Truck”. My brothers and sisters and I picked out packages of store-bought cookies (a real treat since we only had homemade ones growing up) and packed them and gallons of milk for the night of the Cotton Cookie Campout. We piled into my father’s truck … yes all 10 of us … and drove to some remote “perfect location.” My brothers and father pitched the tents and built the fire and my sisters and I organized the other stuff. Then … we gorged. Pecan Sandies, Oreos, Danish Wedding Cookies, Magic Middles (remember those? ), Chips Ahoy, Ginger Snaps … the collection was amazing to my 10-year-old eyes. “Aaahhhhh no. There are still some cookies left!” My Dad would say when one of us mentioned our bellies feeling full. He was determined to be right. And he was. The thrill of “illegal” cookies stoked the hunger for the sugar. Once it was allowed, the consumption was just a little less sweet. My father made his point and a tradition was born. The camping part now stays in Grandma’s living room. Adelaide is zonked out with her cousins. Last night we had out 28th Annual Cotton Cookie Campout. Well … it has evolved into Cotton Cookie Campfire since no one really camps out out any more except for the occasional tent in Grandma’s living room. And the homemade cookies outnumber the store-bought varieties since we now far prefer our personal baked creations. One thing remains the same: the night and the memories could be no sweeter.